Someone once told me that my spirit animal was a small dog who thinks it's a big dog. That felt apt, until Missouri police discovered a 200-pound alligator named Catfish who thinks it's a small dog, fears the dark, and devours Wendy's chicken nuggets. That alligator is me. I am Catfish. 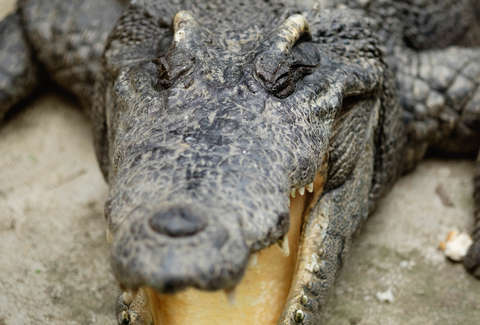 On Wednesday, the enormous gator was separated from his caretaker, 35-year-old Sean Casey, when Kansas City officers arrived at his door to evict him from his home, according to KCTV. At the time, they were unaware that they were also evicting three snakes, one rabbit, and Catfish. "They're taking away my little buddy," Casey told a Fox13 reporter, tearfully. "He's not a ferocious animal. He can't swim, he's scared of the dark, and he smiled a lot. You can just tell that he's smiling." Catfish was only two pounds when Casey took him in, and apparently, his steady growth can be attributed to excessive consumption of his favorite food: chicken nuggets from Wendy's. At the time of the eviction, the smiley gator spanned nearly 7 feet -- and it took four animal control officers to remove him from his home. "He's like a dog, I don't think he knew he was an alligator," Casey explained. "He used to sit in my lap." Two hundred pounds is no small amount -- that's sort of like allowing a very scaly sumo wrestler to sit on you while watching the morning news. But he was Casey's little buddy, so whatever crippling physical pain this may have caused him, he tenderly ignored. Now, the gator is safely locked away at an animal control facility in Kansas City, and according to a Fox News report, he's still smiling. At this point, we're all far more worried about Casey.